The summer is officially here, and with it the warm weather. Kids are out of school and there are lots of activities to enjoy. Definitely a great time to head out to spend some beach-time in Rocky Point or to stop by Barb’s Dog Rescue to play with one of the many puppies and dogs. Better yet, pick up a rescue dog for an hour or two and take him or her for a fun day at the beach! There are always a whole lot of young puppies this time of year which is what we call “puppy season” and we really would appreciate any volunteer help socializing them. With so many dogs that come into the rescue on a weekly basis, we are always in need of people to stop by to play with the puppies and dogs and get them used to being held, walked and used to kind, caring people (we also desperately need puppy dog food!) Someone is always at Barb’s Dog Rescue so come by anytime even if you just have a few minutes of time to give! Thanks to a wonderful couple who is helping us with an expanded shelter and larger dog runs and play areas, there are always puppies to be cuddled and play-time to be had. We have well over 150 dogs and puppies for you to choose from! All of the dogs at Barb’s Dog Rescue are up for adoption and we believe that every one of them – young or old, shy or extremely playful, small or big – deserve a home and a second chance. When a puppy or adult dog arrives at the rescue, we quarantine them to be sure that they are given the proper shots and are monitored for any health issues before introducing them to the rest of the dogs. All of the animals are spayed and neutered so that the cycle of pet overpopulation cannot continue with more litters of puppies – at least with the animals we are able to reach. All of the costs that go into helping each and every dog add up and now that Barb’s Dog Rescue is an official 501 (c) non-profit organization, we hope you will consider making a tax deductible donation supporting our efforts. We have a beautiful boxer, a yellow lab, small dogs of every breed including poodles and big dogs of every breed and mix! Please spread the word that Barb’s Dog Rescue has every type, age, size, temperament of dog or puppy available so if you or anyone you know is interested in adopting, Mexico dogs are the best! We would not be able to help any dogs or puppies without your support and all donations are greatly appreciated. Donations can either be dropped off at the rescue, mailed to P.O. Box 116, Lukeville 85341 or at www.barbsdogrescuerp.com. We can also coordinate donations to be transported from Phoenix to Rocky Point. Please visit us on our Barb’s Dog Rescue Facebook page as well for updates, pictures and news. 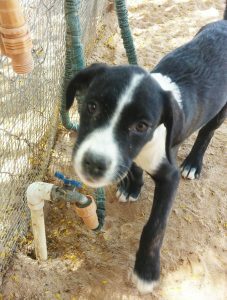 Is this little black and white dog pictured at the top of your July newsletter still available for adoption? What type of breed is he / she and about how old is the dog?